It's never truly a party until Cadence Weapon shows up. 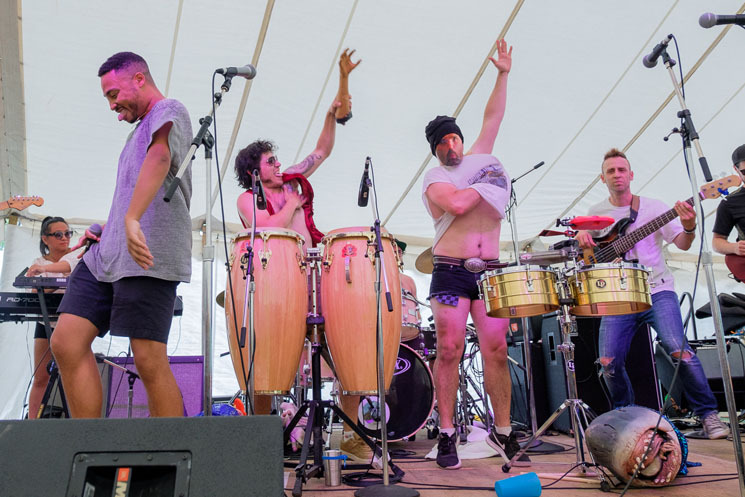 Midway through the first song of "Alphabet Street," the inaugural workshop of Hillside 2018, which found the many talented folks of Vancouver collective Five Alarm Funk delivering an extended instrumental jam, the Edmonton-bred rapper strolled onto the Island Stage area and simply waited it out side-stage, getting a feel for his collaborators. Following Cree electro-popster Iskwé's impassioned performance of "Soldier," Cadence took to the stage to truly ignite the collaborative fires, bringing all of the performers together for a free-spirited workshop that embodied Hillside's carefree, community spirit. It was a great way to kick off the whole festival. Starting off by asking for some jazz fusion and beat-boxing a suggested beat, the Five Alarm folks came in instantly with a full, percussion-heavy instrumental, to which Cadence spit furious bars on top. He was instantly rapper, bandleader, conductor and singer, effortlessly guiding the crowd through some call-and-responses. Once the collaborative ball started rolling, it was unstoppable. Iskwé brought out the Five Alarm horn section and Cadence Weapon for an extended rendition of "Midnight," a self-described "late night jam" whose mood was bolstered by slinky horns — sure, it was only 6 p.m., but it didn't matter once you added Cadence's verses and a sax solo to the mix. Toss in some guest percussion from a child in the audience, Five Alarm Funk's endearing props (including giant shark heads and fake limbs) and Iskwé and Cadence Weapon's full-hearted embrace of the power of collaboration (often calling on specific sections of Five Alarm Funk to join them) and you have a strong start to one of Canada's most uniquely enduring festivals. Five Alarm Funk Reveal 'Sweat' LP, Share "DDPP"